The introduction of a camera trap at the Tremisana waterhole has been a wonderful revelation ! It is attached to a Marula tree that thankfully has survived some seriously close encounters with elephants and buffalos. Despite the camera covering only a third of the waterhole (and therefore most probably taking photos of only a third of the animals coming to drink) we have had some brilliant shots. The camera trap works on a passive infrared motion detector sensor and any movement within its range triggers the mechanism that takes a photo. It also records the date and time. The last 10 days of July were very productive – we even had lions and leopards at the waterhole. The lion and lioness photos were taken at 03h37 0n 27 July and two leopard photos were taken on 21 July at 22h59 and 23h42. The waterhole is conveniently situated a mere 30 metres from the Lapa. It has a floodlight and it is possible for the wildlife addict to sit on the easy chairs of the Lapa and spend the entire night waiting and watching. Practically this is unlikely to be a good idea as our safari program is very intensive and the vast majority of our guests usually hit the sack straight after dinner ! We are always pleased to illuminate the waterhole should an intrepid game viewing guest so request. Marco, webmaster extraordinaire, has added most of the camera trap sightings onto our website, www.vivasafaris.com, and there is a link on the Home Page (below the photo of water features and lush gardens at Tremisana). Alternatively you can keep abreast of the comings and goings at the Tremisana waterhole by looking at www.facebook.com/TremisanaLodge. Apart from some great Big Five sightings, there are photos of generally nocturnal animals such as Civet, Side-Striped Jackal, Porcupine, Genet, Honey Badger and Bushpig. As mentioned in a previous newsletter, the sighting of a sounder of three Bushpigs was a first for me at Tremisana. We have had this lodge for over 20 years and it took us over 20 years to get a sighting of Bushpigs ! The Bushpig, POTAMOCHOERUS LARVATUS, is mainly nocturnal (some books use the fancy word crepuscular – meaning initially active at twilight – as the sun sets). It is very different to the Warthog which is strictly diurnal and holes itself up in a disused termite mound at night. 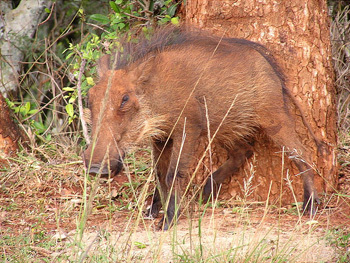 Bushpigs are larger than Warthogs with boars reaching 1 metre at the shoulder and weighing up to 140 kg. Unlike Warthogs that run with tails vertically up like antennas, Bushpigs run with their tails down. Bushpigs have short, sharp tusks. They have blunt snouts and have a light coloured mane that bristles when they are excited. I have invited Brass from Campfire Academy (an excellent training centre for prospective guides) to come to view the Bushpigs as she, like Luke up until a few months ago, has never seen a Bushpig in Balule ! The Bushpigs of Tremisana are becoming celebrities ! Most of the dams are dry. Normally at this time of the year they still have water. Our job this year is very easy. We simply spend time at dams waiting for the animals to come and drink. Our guests also like to stay at the water to enjoy good quality viewing not just driving. At Nsemane dam many animals including general game like Zebra, Impala, giraffe, waterbuck, elephants and lions drink here daily. Just after Orpen gate we spotted two big elephant bulls walking along the road and causing a traffic jam. En route to Timbavati Picnic spot, one of my guests spotted two leopards walking along the river. The bushbuck’s alarm calls alerted their friends about the danger. Later a herd of elephants arrived to drink water and feed along the river. On our way back we stopped at Nsemane dam. 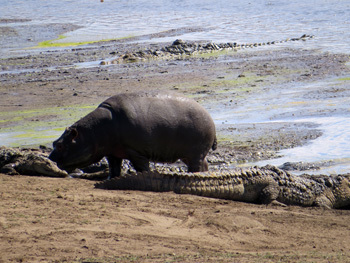 One young hippo came out of the water and walked in between two big crocodile and slept next to them. Incredible ! Hippo and crocs close by at Nsemane Dam. 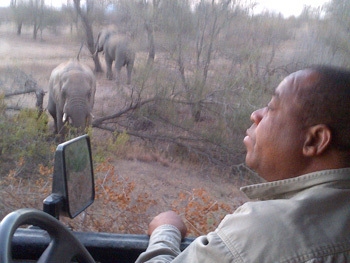 On 30-07-2015 PRIVATE TOUR Full day KNP via Paul Kruger Gate. Clents that booked an extended private safari requested to visit the South of the Park. We usually do not visit this part of Kruger. Near Paul Kruger gate, a leopard stopped in the middle of the road for a few minutes. Along the road to Lower Sabie we had a sighting of Hyenas eating a small impala and fighting over it. It looked like the impala was road kill. The traffic in the South is far worse than that in the Central Section where we usually drive. A few kilometres away two white rhinos were grazing along the road. Lots of elephants and buffaloes walked across the road in front of us. The day in Kruger has just begun – expectations are high. As usual lions are right up there on the list of things to see. We head through the gates, eyes scanning across the plains – the search has begun. The ever present impala welcome us, standing on the road, making sure we stop and have a look at them. Baboons sifting through the undergrowth, in search of tasty treats like spiders, are surrounded by other animals like zebra and wildebeest. Baboons are excellent security guards, often sitting atop of trees, scouting out for potential danger. A broken branch lies in the road – we all know the culprit. The elephants must have been through the area recently, especially since there is still fresh dung on the road. I slow down and scan the area, hoping to spot a large grey object. And there they are – ears flapping, trunks in the air smelling this foreign object – we’ve come across a breeding herd, of all shapes and sizes. The young calves are carefully protected by the mothers, making sure they are always hidden from potential danger. The little trunks are still struggling to grasp the grass, taking many attempts to fill their mouths. The mothers stand pulling at branches, skilfully removing the bark, leaving the branches bare. A loud rumble and the matriarch has decided it’s time to go – and the elephants are gone. The morning is getting hotter; it’s a good time for the animals to enjoy a drink, knowing the lions are most likely too hot to be out hunting. We get to one of the bigger dams and find hippos and crocodiles basking in the sun. Big herds of impala and a few scattered groups of kudu and zebra, nervously head down for a drink. Luck is in our favour today – while sitting watching the animals gathering around the water hole, we have a special visit. On a raised bank we spot a shape that can only belong to a lioness. She stands on the bank looking around, waiting for her three little cubs to appear. An amazing sighting! We set off again after lunch at Satara, still searching for buffalo, rhino and the elusive leopard. It takes time before we see our next member of the big five – it is our grumpy friends the buffalo – a herd of around three hundred. In the heat of the afternoon most animals enjoy an afternoon sleep – the buffalo are no exception. They all lie under the shade of the trees, chewing on the cud. Three down and two to go – we are doing very well – luck is on our side. We continue searching away for animals, spotting a few ostriches and some beautiful big male kudus, with their large twisted horns. The big prize comes in the form of a large male white rhino, walking slowly past us. We watch the big guy walk slowly away from us into the thick bush – another beautiful sighting to add to our list. After stopping for a quick break at Timbavati picnic spot, we head for the gate. All of us, happy with how our day has panned out, are hoping to find our fifth member on the list: the elusive leopard. Time is ticking and we have almost reached the gate – our chances for all big five in one day are looking slim. The road ahead brings hope, no animals visible, but many motor vehicles. I stop alongside a vehicle and ask what they have spotted. It is a leopard, but they have unfortunately lost sight of it in the long grass. We wait patiently scanning the area and then our good friends the impala raise the alarm. We zoom past all the stationary vehicles and use the impala as our guide and we hit the jackpot. Walking casually along the side of the road is a very beautiful female leopard. She had been thinking of stalking the impala, but they spotted her long before she could catch them by surprise. It is a great ending to the day, definitely one to fondly remember. ending to a brilliant day. This month’s animal sightings have been amazing. We have seen the Big Five every single day! I am very happy because the guests are enjoying the Kruger Park so very much. The major concentration of animals is around Nsemane dam and along the Timbavati River which has a few pools of water. Near the Timbavati picnic spot, we found a male lion sitting next to a tree with a buffalo carcass. He was busy chasing after irritating vultures – it was a battle of birds of prey and the male lion trying to protect the carcass from the vultures. The next day we had a brilliant day: we saw elephants at the Orpen gate, then a breeding herd of buffalos and near Satara a rhino killed by poachers on the S41. Three lions and two lioness were scavenging. We are struggling with rhino poaching in Kruger and it is very sad. The lions spent about four days feeding on that carcass. We then drove towards Timbavati, a great area for leopards. On the S90 we found a leopard lying on a Jackal berry tree. At Nsemani dam there were hippos, buffalos and a lot of antelopes. Opposite the dam a leopard was sitting in a tree. Baboons on another tree were giving alarm calls but the leopard did not move. Next to the Timbavati bird hide we found two male lions sleeping and one got up and started walking to the shade towards our vehicle. My guests took brilliant photos! With the number of rhinos being poached every day, I was surprised to come across four rhinos. This zone was once a major rhino-sighting area. Now rhinos are so hard to get here – to my surprise the four we found had just finished drinking water. They slowly moved towards our open vehicle. I am so sad. I wonder if they will be here next month. I am a newly qualified guide from Campfire Academy and am so very grateful to be getting this outstanding opportunity to gain practical experience. I started at Viva Safaris in June and was engaged as a tracker for the first month so that I could experience the new roads and learn from the senior guides. My first sighting was one of the best. On an afternoon game drive we were pleasantly surprised by a breeding herd of elephants. They just kept coming closer and closer until the matriarch decided that it was time to leave us with a dramatic head shake and trumpeting. While we were doing an afternoon drive, we went down to the Olifants River and we were greeted by a male cheetah lying in the open having a rest. Wow ! For a week it seemed as if the elephants liked me because they showed themselves everywhere – even at the Marula Boma, where we entertain our guests to an unforgettable Bush Braai. While on a bushwalk with Rex we had an amazing sighting of baby hippos, giraffes, elephants and all the common antelope and birds in the area. My other great sighting was as a result of amazing luck and timing. We were driving around with the guests on an afternoon game drive when we got stuck in the river bed. We were then surrounded by elephants. When we finally got out and came around the corner we drove onto a leopard sighting. On a Champagne Breakfast drive three lionesses and their six cubs right in front of our Landcruiser. It was so beautiful. Lioness and cubs so close to the Landcruiser. While driving to the property where we conduct the Bushwalks, we saw a female leopard on Marula road. On the walk we also saw hippos and crocodiles. During the sunset drive we saw elephants at Campfire. A white rhino near Kambaku, lions and another leopard made my clients’ day. Large herd of elephants near Tremisana Lodge. While doing the bushwalk on the 18th we came across a beautiful sighting of a leopard on Rome 1. The leopard is called Vatsakile. It was most exciting to see the leopard walking in between a herd of elephants. We were standing on a hilly outcrop and saw this amazing sighting. 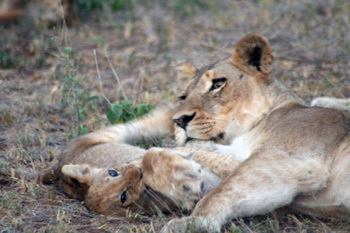 Later in the evening we came across two lionesses lying on the side of the road. Rex close to elephant herd. On 1 August I did a full day in Kruger National Park. It was cold but the sightings were very good. There were elephants at the first gate at Orpen and buffalos lying down at the second gate. At the Orpen waterhole there was a breeding herd of elephants drinking water. There were lions at Nsemani dam. 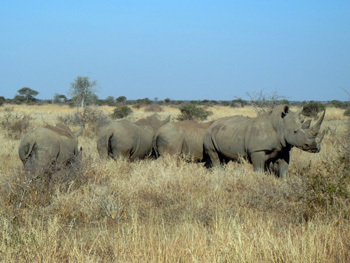 As we drove along there were some rhinos on the road to Olifants. On another drive in Kruger I had only three guests. Our first sighting was of some buffaloes at Orpen waterhole, then elephants on Rabelais and six lions at Nwanetsi bridge busy feeding on a buffalo bull. On the S90 we saw a white rhino. We saw a lioness with an impala carcass on Phelwane bridge. There was a buffalo herd along Timbavati, four rhinos and a cheetah with an impala kill. On 15th at the Timbavati turn off we saw six buffaloes crossing the river. There were elephants on the Timbavati river bed. Buffaloes at Nsemani dam and at the Timbavati picnic spot we saw eight lions trying to hunt some impala. On the 18th we saw two white rhinos on the road near Orpen. 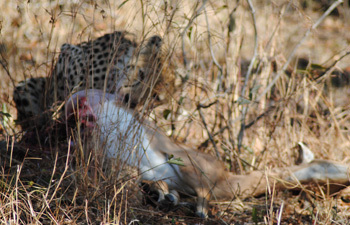 At Mudzadzeni we saw two cheetahs eating a waterbuck. We saw lions at Ratelpan. Lion sightings have been great this month and I hope that August will be the same. This winter has been extremely cold. The treehouses and tents along the Klaserie River have experienced temperatures of just above zero. Janetta and Margrett have been supplying extra blankets and hot-water bottles. Of course, some of our north European tourists (apparently from Germany, Finland and the Netherlands ) have laughed the cold off and, quite insanely, in my opinion, have had dips in the pool after returning from safaris to Kruger Park at 19h00 !!! The cold has the effect of getting the Nyala to lie down by early evening and they simply won’t budge even when our guests approach to within 1 metre to take photos. 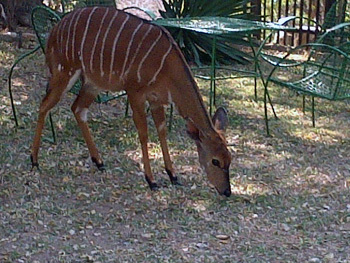 Nyala grazing in Treehouse Lodge gardens. 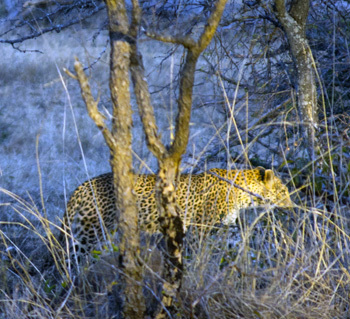 Leopard activity has also increased this winter and we hear the leopard almost every night. We also hear the lions roaring – these emanate from two places : Kapama Game Reserve across the road and Jonathan Beretta’s (Warden of Motlala) lions which at the moment are in an enclosure near his house. I am told that he is awaiting permits before the lions can be released. We have employed an armed security guard at the Lodge and he walks around at night so I foresee that he will be handy in escorting guests once the lions are free to move to Marc’s Treehouse Lodge. The Breakfast Dam has been pumped full of water as the fish were struggling with the low levels. The effect of a full dam has been increased animal activity and many more bird sightings. The month of July has gone by so fast. I am so thankful that the days are warming up slowly but surely. The sun is always a welcome visitor this winter. There is one thing that has kept me excited this whole month : the little trap cam by the watering hole near the guesthouse. I am so excited each time I pop out to go and collect the memory card. I am always sure that there is something that is going to make me smile. There are so many animals that visit the watering hole. The side striped and black backed jackals, buffalos, bush pigs, duiker, civet and a whole lot more. There have been lions, leopards and cheetah. I will NEVER forget the day I got the first cheetah – I was so excited I’m sure the ladies were wondering what was wrong with me. My personal favourite is the porcupine. I am recording the times of his visit so that I can catch a glimpse of him with my own eyes as I have never seen one. The elephants never disappoint and always visit. At least this month none came into the lodge. The electric fence seems to be doing a very good job keeping our good friends out. I really love them with all my heart but I really feel that I can love them from a distance. Last week we had a large herd of elephants at the back of the lodge. It was a quiet Sunday, and Luke and I spent quite some time with the big guys. They were busy feeding and going about their own business. One of the younger elephants slowly started making his way towards us. Thank God he stopped halfway and started feeding close by. This month we have welcomed two new students from the International Hotel School in Durban. We look forward to working with Charl and Yegen and we hope that they will learn valuable lessons during their training. Speak again next month! The electric fence is now fully operational not only on AC but also on a battery if and when ESKOM decides to load shed. By and large, our guests are quite accepting of the fact that there is no electricity for 2 hour periods – in fact one group of six Italian ladies that I was engaged to guide were happy to have another dinner by candlelight at Tremisana after the previous night’s Bush Braai at Marula Boma where there is no electricity. Marula Boma has been an awesome hit ! The number of “oohs’’ , “aahs” and “wows” that we hear as the vehicle approaches the fairytale candle-lit dining area is unbelievable. We insist that the guides arrive when it is completely dark for maximum effect. It is very gratifying and fulfilling to know we have such happy and appreciative guests. Letitia Cronje, owner of Campfire Academy (mentioned earlier) asked for our permission to conduct a sleep-out for her FGASA (Field Guides Association of SA) students at Marula Boma. I went along to experience her program. Wow ! It was exceptional. There is no artificial light, the only sounds are of the African bush and the clarity of the stars was the best I have ever seen ! We heard the wailing jackals, the eerie whoops of hyenas and the distant roars of lions. It was quite surreal. After our braai, we were visited by Civets, Jackals and Genets. It was also cold, despite our being around the fire and I eventually moved into one of the storerooms – sorry but I am three times as old as these students so they all understood. The next day, we enjoyed a piping hot cup of coffee and rusks while watching the sun rise. Letitia then took the group on a very educational Bush walk. I thoroughly enjoyed the whole experience. I look forward to doing it all again in September when it is warm enough for the old man to sleep around the fire, without risking death by extreme cold ! I am now thinking of engaging Letitia to use Marula Boma to conduct sleep-outs. I reckon it will become a highlight for those tourists who really want to have an unforgettable bush experience – keep watching this space ! Thank you for the calls I received welcoming the 2016 tariffs. We are happy that the increases have been so readily accepted and we are very pleased to know that you believe you will have no problem in continuing to easily sell our products. For us it is critically important that our guests receive the very best value for money safari experience. I know from my own travels that I cannot stand being ripped off – it is so irritating to know that one has paid a lot more than one should have – profiteering gets my hot Italian blood coursing through the veins at rates the cardiologist is most unhappy about – thankfully I take my daily blood pressure pills religiously ! The entire staff of Viva Safaris would be unhappy to know that your experience with us has raised your blood pressure ! We thank you for your support and commit to giving the clients you book with us an unforgettable safari experience. Our Bush Walks remain a very much enjoyed and appreciated component of our safaris. We are fortunate in walking on a superb property on the Olifants River. Co-owner Wynand Britz sometimes assists our rangers in our walks – thank you very much ! 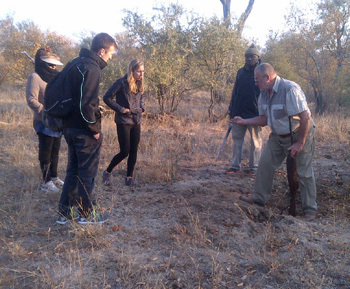 Highly experienced Wynand Britz points out interesting feature during Bush Walk. The food and accommodation was tremendous, so if your looking for an awesome safari experience, look no further than Tremisana Game Lodge! My family of 4 with 2 teenagers embarked on our lifetime adventure in Africa with a 4 day stay a Tremisana lodge. We were blown away by the guest house, and sat for a long time on arrival on the porch enjoying the monkeys. From the night drive and a big boma dinner under the stars, to the walking safari along the river, to the full day in Krueger, we were more thrilled with every adventure. The sunrise tours were extraordinary, though they started off a little cold in the open jeeps. The guides and lodge staff were excellent, and we were thrilled with the quality and diversity of the food. Even the drive from Johannesburg was spectacular with the stop at Blythe Canyon. I would recommend this lodge and Viva Safaris to anyone wanting a safe, but exciting South African Safari. I stayed at Marc’s treehouse camp in the tents for 2 nights. I was a little sceptical when it said I was staying in a tent, however, I was pleasantly surprised. The tent made me feel like a really was in the bush and allowed me to make the most of the whole ‘safari’ experience. The staff were awesome and the bar had incredibly good prices! Would recommend to all.